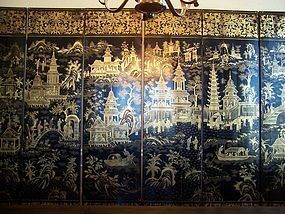 From our Chinese Polychrome Collection, a magnificent eight-panel gilt lacquer export screen, 19th century, exquisitely painted in finely detailed gilding on a black lacquer ground, depicting a wide array of festive scenes with figures in elaborate garden pavilions and riverside pagodas, with rolling mountains and hills in the distance, all set inside a floral and key-fret scroll border. The scenes portrayed exhibit a wonderful range from courtship scenes to musical ensembles to riverboat rides, all painted with tremendous skill and proficiency. Looking closely, one can see that there is a wonderfully uncommon individualism and variety to the figures, their faces, and their clothing, with such detail and variation being the clear mark of a master artist. For an added visual treat, look for the subtle panache of red pigment sparingly used as hair accents on the women and cap colors on the men throughout the piece. Overall this is a fantastic and high-end example of this genre. The back, in contrast to the elaborateness of the front, is decorated in a more reserved and restrained style using depictions of flowers and birds. Please note that this is a complete eight panel screen, but that the last two panels do not appear in our photos here simply due to lack of space, as we did not have a single wall long enough to accommodate all eight panels at once. But the last two panels have been photographed separately, and those photos are also available for anyone seriously considering this piece. We will try to post a supplemental listing with those additional photos in a few days. Size and Condition: Each panel is 84 1/2 inches tall, and 21 3/4 inches wide. There are various areas of splits and cracking to the lacquer and wood panels commensurate with age, but this is an expected form of wear for these types of pieces, and they do not detract from the beauty and grandeur of the piece.